One thing that many of the world’s cultures and belief systems have in common is the understanding that threads and connections link not only human to human but to every living thing. Wiccans, Shaman, Buddhist, Native American, South American, quantum physicists, ecopsychologists and more besides all agree that we are part of a gigantic web of life, the only difference really are the words they use to describe it. Some talk about everything that exists being alive and having a spirit, some about all things on earth having a common bond, some about everything being connected and being part of a vibrating circle of energy and others about particles, containing dancing strings sending out vibrations or notes. Different words but a common understanding. Whatever way we look at it we are interconnected in a deep and fundamental way and it should be impossible for us ever to think of ourselves as separate from anything else that exists. Ecopsychology which is the science of healing with nature, encourages us to recognise that we are part of a huge web of life and so part of the balance of life. Only by being aware of the Interconnectedness of all and the specific connections that develop as we move though life can we find balance in our lives. If we can learn to speak with, listen to and learn from reality, in doing so we can move through life with a clearer understanding of the Interconnectedness of everything and of how to harness some of these connections to help and support us. The Andean shaman of South America have gifted to the world a series of nine shamanic rites known as the Munay Ki. In these rites Hummingbird holds the energy of the Ancient Ones. In doing so it helps us remember ancient ways and is said to represent the courage required to embark on the epic journey which eventually leads us back to source. I met first Hummingbird as a small child in London where I would stand fascinated outside a shop that had some in captivity. Although I wanted them to be free I could still be left for hours still and silent as I watched these tiny birds hovering and feeding in front of me. I have met them since, not in captivity fortunately but where they should be, in the wilds in America and Peru and am no less fascinated by them than I was as a child. When I received the nine rites of the Munay Ki I then met Hummingbird once more, but this time on a more personal level. During the Harmony Rite of the Munay Ki, archetypal animals are placed into each of the chakras or energy centres. Hummingbird is placed into the solar plexus. Afterward, for a minimum of two weeks each, the archetypes are fed with fire so that the person receiving them can get to know the archetype and receive guidance and messages from them. It was as I worked with Hummingbird here that it first showed me strands or fibres that connected me with every other living thing. As I watched I could see what looked like optic fibres of green light flowing from me and to me. I saw how I easily I could reach out and touch each and every one of these fibres and in doing so could bring to life the connection with whatever or whenever was at the other end. I realised in this moment that if we knew how, then we could access anything that we wished to, just by reaching out to the right connection. I also realised that these strands surround us all the time and that we walk through them every minute of every day without being aware of it. Simple, but at the same time, mind blowing. I always know when Hummingbird is always close to me for I feel restless, unsettled or dissatisfied with where I am and what I am doing. For me the way I feel reflects the continual motion of the Hummingbird’s wings as it fights to stay in the air, to hover to feed and to fly. Hummingbird then acts as a signal for me to look at what I might need to change or shift. The fact that Hummingbird isn’t built for flight also reminds me that what looks as if it should be impossible isn’t always so and from this I draw courage. Hummingbird has brought me some of my greatest insights including the realisation of how much energy I expand trying to stay where I am when I resist moving forward, something I do all too often. Now when Hummingbird is around I always try and listen so that I don’t waste more energy than I need to. ‘Listen to me now and stop trying to fly backwards for that never works in your best interest. Relax, let go and allow the energy that you have built up to drive you forwards. It is never a good idea to stay in one place too long, to get comfortable or complacent and although sometimes it may seem that you are not ready to move on, just trust that this is the right thing to do. When you attempt to hold on to the past, which is what you do when you resist the forward impetus, then you only delay the inevitable, you do not avoid it and never can. Accept, release, and find the beauty and joy in what is ahead’. Profile of the Week on the Art Colony site. Chance to find out a little more about me and my art. Like many of us I have herbs growing in my garden. Some of them have a wonderful fragrance when their leaves are rubbed, some are used for cooking, some for healing, some go in teas or tinctures and some like sage and Rosemary have multiple uses one of which is to cleanse space. Unlike a herbalist, as a shamanic healer I don’t worry over much about the scientific properties of any of my herbs for this information is not what I need when I wish to work with them. Instead what I need to know is the spirit of the plant and how it will work either with me or with my client. I am though sensible and do always Google a herb or plant to check there are no contraindications. To connect to the spirt of anything I journey to meet it and herbs are no different. Then having met the spirit I take in all that it has to share with me. This might be what it can be used for, how it will work in this instance, how much and how long it is to be used for and how it is to be used which could for example be in a tea, a tincture or even in a bath. The very first time I wanted to use a herb in healing I decided to journey to see which herb if any wished to work with me. I was shown a plant that I recognised as wild garlic. Within the journey I was told to work with the leaves, take them and dry them, that they were to be made into a tea which I was to take three times a day for three days. I was also told to make up a lot of the tea and store it in an airtight jar in the dark for then I would always have it when I needed it. After journeying I looked up the medicinal properties of Wild Garlic as I knew nothing about it and found it is beneficial in the treatment of asthma, bronchitis, emphysema, respiratory failure, coughs and pulmonary tuberculous as well as having antiviral properties. It can also be used to help lower cholesterol, lower blood pressure, as a diuretic, a stimulant, a vasodilator and as a tonic. There are no contra-indicators although it can be confused with the autumn crocus which is poisonous. As I am asthmatic and have to be careful when I get a cough I use this tea often. It has saved me time after time by making sure the cough doesn’t cause further problems for me. The making of teas with herbs is easy and quick. All you really need to do is pick some, rinse it and then let it steep in hot water. For herbs that I use a lot in teas and which are only available for a short time such as wild garlic, I pick, dry and then store a dark place in air tight jars. There is nothing more wonderful than a pot of freshly picked herb teas and many herbs combine nicely so do experiment and see what you enjoy. One of my favourite teas in the summer is lemon balm. Tinctures are also easy although they need to be left for around four weeks before being used. For a tincture herbs are picked and placed in an air tight bottle. The bottle is then filled with vodka and placed again in a dry dark place. It does need to be taken out and shaken every few days though. The mixture can then be taken as required. Sage or Sage and Rosemary bundles for clearing space are also easy to make. The herbs are picked and bundled together. I often fold the bundle in two so it is quite thick. The bundle is then rolled back and forth inside a piece of carpet or similar which removes some of the moisture. The bundle then needs to be tied at one end with thread, the thread then should be wound round the bundle in a spiral to the other end. Here it is wound around a few times then wound in a spiral down the bundle once more and tied off. This bundle then needs to be wrapped tightly in newspaper held in place with an elastic band and then stored in a dry place out of sunlight. After a week the bundle should be unwrapped and rolled again tighter and then left until completely dry. It’s a year now since my first book Web of Life was published and during the last year I’ve been nurturing it like a baby. No one warns you what it’s like to write a book, or maybe they would have done if I’d ever thought to ask perhaps. The reason I didn’t would be that the book wasn’t really planned, it seemed to take on its own life and in doing that to write itself. It all began when I was working with the Medicine Wheel, or rather trying to work with it. When I was with others the wheel made sense, the idea of ceremony and healing, teachers and lessons seemed worth working with. When I was alone though it was a completely different story. None of it stayed with me and I found myself chasing the ideas that had seemed so important. Eventually I realised that none of it fit me at all. It was not my culture and so had no meaning for me although the power and ideas behind it did. Then the discovery that different Native American tribes had differently Medicine Wheels suddenly made it all make sense and unbeknownst to me the seeds for Web of Life were sown. Alongside this I met a new guide, one who told me he was to help me with my writing.The key word here is HELP, as I was reminded over and over again during the writing of the book, although at this point I still had no thoughts of writing anything. Then one day I found myself playing with ideas about creating something that I could use to create my own type of Medicine Wheel, although as I’m not Native American it wouldn’t be a wheel but a web. The idea then began to grow that if this could work for me, maybe I could create something that could be used by anyone, regardless of their background, culture or beliefs. From this the book began to take grow. Then as I worked I discovered that my guide would sow an idea, I would journey, explore then suddenly it would click and the next part of the book could be written. Often I discovered something for myself then having done this would stumble across an article or a website that reinforced what I had just discovered. It was clear all the way through that I had to find the answers for myself before I was given confirmation. This is completely fitting as Web of Life is about finding your own path and the guides or teachers that can help you on it. Everyone that works with the book finds their own unique path, creates their own web to work in, connects with their own teachers. Had I used the words or ideas of others instead of finding the path on my own then Web of Life could not help others to do the same. Many was the time during the two years or so that I was writing Web of Life that it lay dormant on the work top, neglected and unloved. This was important I later discovered, as it was during these times that my own understanding grew, as I continued to seek answers and understanding through journeying and through continuing to explore my own path. Understanding came slowly at times and was often the end result of months of work when suddenly things would make sense and there was a ‘Eureka’ moment. By the time the book was at a stage where I needed to hand it over to readers to trial and test I knew that it could not be finished until this was done. So again I waited this time for feedback from others. Another gestation period it turned out, for by the time the feedback came I had had plenty of time to work with the web and the cards that are made as part of the work, for this is a book of exercises and activity, and in doing so I had learnt new ways of creating a path using the cards. All the time I was writing I held onto the belief that if it was worth publishing I would find a publisher. The trouble was I had to be brave, find the courage to send in a draft manuscript, to hand over the very thing that I had been creating, giving birth to and let it see the harsh light of day. Fortunately I delivered it into safe hands and it was lovingly received and brought into being by the wonderful team at Moon Books. And this is where the nurturing really began rather than ended as I had naively expected. Like a baby taking its first steps it was sent out for review. It was nourished through articles that I then wrote for magazines and book clubs, through its own Facebook page, through a book launch, readings and talks and still the nurturing goes on for like any creation it needs my energy to combine with its own energy to keep it alive and I suspect like any child it always will. One of the most important things that you can do for yourself and your health is to learn how to ground both yourself and your energy. Basically grounding is just a physical way of connecting yourself to the energy of the earth. On a purely practical level, grounding yourself helps you to cope with the day to day practicalities of life which can be hard to do if you are spaced out or living in your head all the time. By grounding yourself it can help to still your mind and find that quiet space where your thoughts are no longer in charge of you, or as my tai chi instructor says ‘quieten the monkey brain’. This then can help you to find clarity or to be more focused. Research is now showing that grounding can have very real and tangible health benefits due to the electrons in the Earth. These can help to support your immune system, detox the body, help with circulation and with bio rhythms. Grounding can also speed healing, improve sleep patterns and lower stress. There also a whole grounding movement now called Earthing which encourages people to use Earthing mats to ground themselves all the time including when they are asleep, so great are the benefits thought to be. Whenever you are travelling and visiting other places it is good to ground yourself on arrival and in doing so connect with the energy of the place you are staying in. This can help to counteract jet lag and avoid altitude sickness. Grounding at home also helps you to be more connected to the land and the spirits of the land where you are. When you ground yourself you connect with the energy of the Earth, an energy which feeds, nurtures and nourishes our physical bodies. Without this energy our bodies can easily become sick and tired. Grounding helps to balance us. This is especially necessary to be aware of if you are working with energy such as Reiki where you connect and channel energy through your crown. This energy feeds your upper chakras or energy centres; crown, third eye and throat and unless you are grounding and feeding the lower chakras; solar plexus, sacral and root, it is very easy to get out of balance and become sick. If you are working either with energy or shamanically then it is always best to ground yourself before starting to work. With energy work this helps to keep you in balance as you channel energy. With shamanic work this also helps to keep you in contact with your physical body, very important if you are journeying so you know where to come back to. Also once you are grounded you can then start to build your energy and become power full. You can also re ground and thus rebalance yourself when you finish working. Once grounded if at any time you feel you are holding excess energy or energy that doesn’t belong to you, then you can give it to the Earth so that it may be transformed and used by the Earth. So, how do you ground yourself? The easiest way is to walk bare foot upon the Earth. With your bare feet in contact with the surface of the Earth whether it be soil, grass or sand it is easy to feel the close contact and to breathe in the energy through the soles of your feet, drawing this energy deep within you. The more time you can spend walking barefoot on the Earth the better it is for your well being. If you would like to know more ways to ground yourself and work with Earth energy there are several ways that you can use on my website www.yvonneryves.com which you are welcome to try out for yourself. I am delighted that my book Web of Life has come joint second in the Pagan Writers Community Celx non fiction competition. Thank you to everyone that helped make this happen. 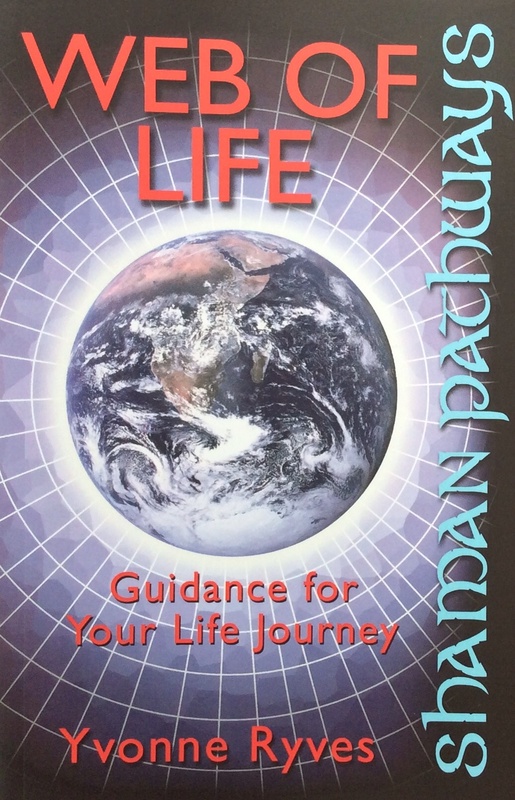 If you haven’t discovered Web of Life yet you can read more about it on the page at the top of this blog.